One of the flagship models from Pirelli's headline Cinturato range, the Pirelli Cinturato P7 AOis available in a huge range of sizes and reasonably priced for such a premium tyre offering incredible perfomance. Scoring well in all internal testing and receiving near top marks in the EU tyre labelling wet braking tests only add to the reputation of such an iconic model. The Pirelli P7 AO aims to combine comfort with pleasure and safety. Part of the Green perfomance range released by Pirelli - designed to lower CO2 emissions through lower rolling resistance and provide increased fuel consumption, saving both you and the Enviornment money. A quieter tyre thanks to the inovative tread pattern and the wider spacing of the tread blocks, all helping to ensure that the tyre met the 2012 EU noise regulations which will be enforced in the coming years to ensure minimal noise pollution. Being so quiet already has the advantage of ensuring the tyre remains legal but also is as comfortable as possible. Great handling in virtually all conditions and exceptional braking in the wet make this not only a fun tyre to drive on but a very safe one at that. So if you are looking for a high perfomance tyre which is eco friendly and also available as a RunFlat, look no further than the Pirelli P7 AO. This special edition of the Pirelli P7 AO has been approved by Audi for use as both original and replacement equipment on a number of their models. Designed to optimise perfomance when used on certain Audi vehicles. Scoring well in all internal testing and receiving near top marks in the EU tyre labelling wet braking tests only add to the reputation of such an iconic model. The Pirelli P7 AO aims to combine comfort with pleasure and safety.Part of the Green perfomance range released by Pirelli - designed to lower CO2 emissions through lower rolling resistance and provide increased fuel consumption, saving both you and the Enviornment money.A quieter tyre thanks to the inovative tread pattern and the wider spacing of the tread blocks, all helping to ensure that the tyre met the 2012 EU noise regulations which will be enforced in the coming years to ensure minimal noise pollution. Being so quiet already has the advantage of ensuring the tyre remains legal but also is as comfortable as possible. 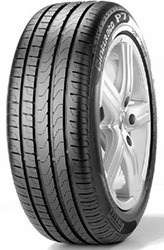 Great handling in virtually all conditions and exceptional braking in the wet make this not only a fun tyre to drive on but a very safe one at that.So if you are looking for a high perfomance tyre which is eco friendly and also available as a RunFlat, look no further than the Pirelli P7 AO. This special edition of the Pirelli P7 AO has been approved by Audi for use as both original and replacement equipment on a number of their models. Designed to optimise perfomance when used on certain Audi vehicles.